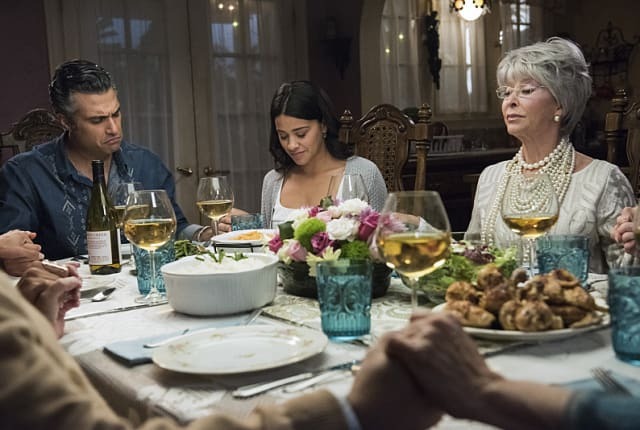 On Jane the Virgin Season 2 Episode 9, Jane needs to use tough love with Mateo, her students, and with herself. Meanwhile, Rogelio discovers a secret about his father. The identity of Mutter is revealed! When you watch Jane the Virgin Season 2 Episode 9, you'll see Jane struggle to use tough love to get Mateo to sleep through the night. She also uses tough love on one of her students in order to get him to write a paper. Jane accepts the fact that Michael has moved on with another woman. Rafael helps Petra out of her predicament with the cops and Magda is officially arrested. Rafael and Michael discover the real identity of Mutter: Elena, Rafael's mother. Elsewhere, Rogelio learns his father is gay. More surprisingly, he finds out that his mother knew the entire time she was married to his father. On Jane the Virgin Season 2 Episode 9, Jane tries to get Mateo to sleep through the night. Meanwhile, Rogelio doscovers a long-held family secret, and the true identity of Mutter is revealed. Everybody knows how gay-friendly I am. Please, I was on the cover of "Out" magazine, in an issue that also featured my very suggestive editorial spread with Neil Patrick Harris. Liliana: Oh, I'm terrified. I moved in with your father right out of my parents' house. I have never been alone. Rogelio: You're not alone, mom. You're not. I promise. Permalink: You're not alone, mom. You're not. I promise.